Which chinese and western zodiac signs are compatible? October 12, 2015 December 16, 2016 Chinese and Western Astrology Horoscope Compatibility	The chart measures all the 144 combinations of chinese and western zodiacs and each pair of signs are given a score based out of 60. 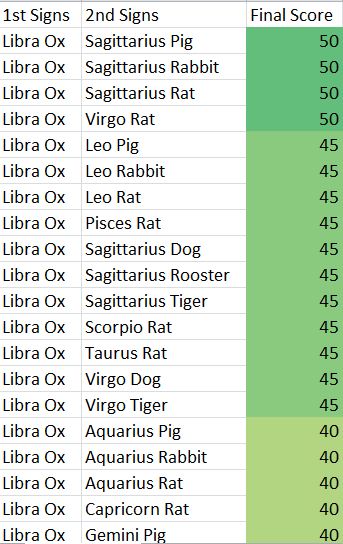 The chart measures all the 144 combinations of chinese and western zodiacs and each pair of signs are given a score. The scores in green are compatible matches, scores in yellow are ok matches and scores in red are incompatible matches. Please fill out the contact form below with your birth date information (mm/dd/yy) to request for your free chinese and western compatibility score chart which will take about 1 to 2 weeks depending on how many requests we receive. Which Chinese and Western Zodiac Elements are Compatible? January 27, 2014 August 8, 2015 Chinese and Western Astrology Horoscope Compatibility	The chart measures all the 144 combinations of chinese and western zodiacs and each pair of signs are given a score based out of 60. Now I’ll offer you a compatibility tip. Notice there are (E) Extrovert and (I) Introvert symbols next to each sign. Each sign is more associated with extroverted traits or introverted traits. People are more compatible when there is a equal balance between (E) and (I) when combining both Eastern and Western Astrology.